The 56th Boyer Lecture Series, exploring the social determinants of health, starts tonight. Over four lectures and four weeks, the World Medical Association president, professor Sir Michael Marmot, will explore the challenges communities face in solving issues of health inequality. Economic costs: Inequity undermines the well-being of a nation’s economy and impedes efficient economic growth. Being financially reliant on and influenced by a small few also builds vulnerability into the economic system. Social costs: Inequity erodes daily living conditions, wastes human capital and reduces social cohesion. Each of these is necessary for a flourishing, cohesive and secure society. Health costs: Inequity harms people’s sense of self and prevents access to the conditions necessary for health. Poorer health results in greater health-care costs for the nation. So how do inequities of wealth and income manifest in Australia? And what are the implications for the nation’s health? A fair go for health? Not everyone has a fair go at living a long, healthy and prosperous life. People at the bottom of the social hierarchy tend to have worse health than those in the middle, who in turn have poorer health than those at the top. This observation, known as the social gradient in health, is seen in countries around the world including Australia. It applies to a number of health outcomes including depression, diabetes, heart disease and cancer. “Who” you are and where you come from has a remarkable impact on your health. Take Anna’s story, for example. Anna is 44 years old and lives with her elderly mother in one of the most socioeconomically disadvantaged urban areas in the country. She is quite overweight, smokes a lot and suffers from depression, but is not inclined to visit her doctor. Like Anna, the poor consistently gain less from health services than the better-off, which leads to untreated disease. This is known as the inverse care law. Anna left school with very few qualifications. Like her economically disadvantaged peers, Anna was always more likely to do poorly in school and to drop out earlier than students in the wider population. These teens grow into adults who have lower incomes and are less empowered to provide for themselves and family. The growth of temporary, part-time and informal work in high-income countries has affected working conditions, with declining job control, financial security and access to paid family leave and flexible working hours. Anna works in a call centre for a large telecommunications company. Her job involves dealing with customer complaints all day, every day. She has no control over the nature of her work or how it gets done, other than to use the mute button on the call. On the up side, Anna has a permanent position with six weeks of holidays per year. But her wage hasn’t increased in the past five years. Anna is financially reliant on her single wage. She cannot afford to buy her own place, which is why she lives at home with her mother. People such as Anna who work in precarious or low-paid jobs don’t have the easy choice of living in areas close to their work. House prices are partly to blame for this social disconnection. The land value gradient growth in many Australian cities in recent years is reinforcing a very strong social stratification of choice and opportunity for generations to come. The quality of working conditions is related to mental health. For people such as Anna, poor-quality work can in fact be worse for health than not having a job at all. 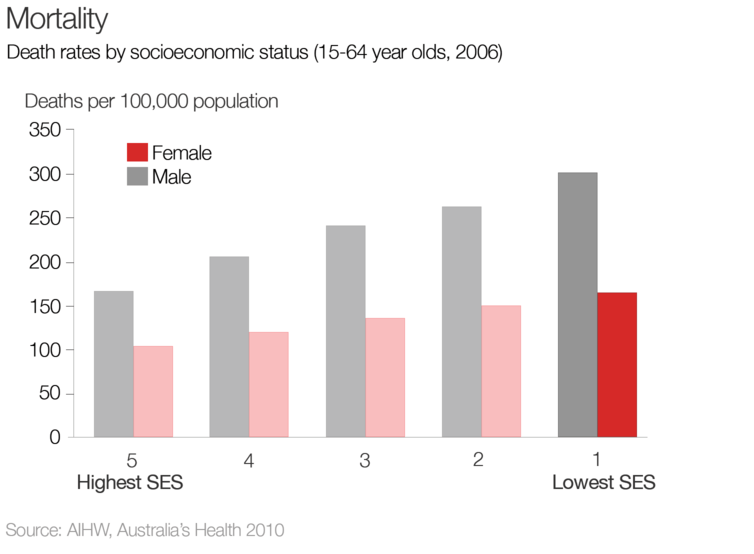 Income inequity is related to the rates of poorer health in a number of areas, from alcohol-attributable hospitalisations and deaths, to child health, to oral health. But health is not determined by absolute wealth. Rather, it is contingent on those around us and how wealth is distributed and spent – what people are able to be and to do. Three interconnected pathways may explain the association between income inequity and health inequities. The “social capital” hypothesis suggests higher levels of income inequity in a society increase the status differentials between individuals. This reduces social mixing across groups, thereby reducing levels of interpersonal trust. This can give rise to feelings of social exclusion, insecurity and stress, as well as leading to decreased life expectancy. The “status anxiety” hypothesis argues inequity damages individuals’ perceptions of their place in the social hierarchy. In other words, less wealthy people see themselves as less worthy. The perception of inferiority induces shame and distrust, which directly damages a person’s health via processes in the brain, but also by reducing levels of social capital. The “neo-materialist” hypothesis suggests there is systematic under-investment in social infrastructure and services in more unequal societies. Social infrastructure influences the level of individual financial resources and provides services such as education, health services, transportation and housing. One example of this under-investment is the Commonwealth government’s proposed removal of the energy supplement. This means people who are unemployed, living on A$38 per day, face losing a minimum of A$4.40 a week. For people on Newstart, A$4.40 buys essentials such as bread or milk. As elsewhere, modern Australia has not served all social groups equally. The systematic differences in social and health outcomes suggest the opportunities open to people were not equal to start with. In a society where material rewards are used as the yardstick of success and failure, it is hard for those who fall behind to flourish. As a society we need to redress the inequities in people’s material resources, the degree of control they have over the conditions that affect their lives and the amount of political voice they can express.